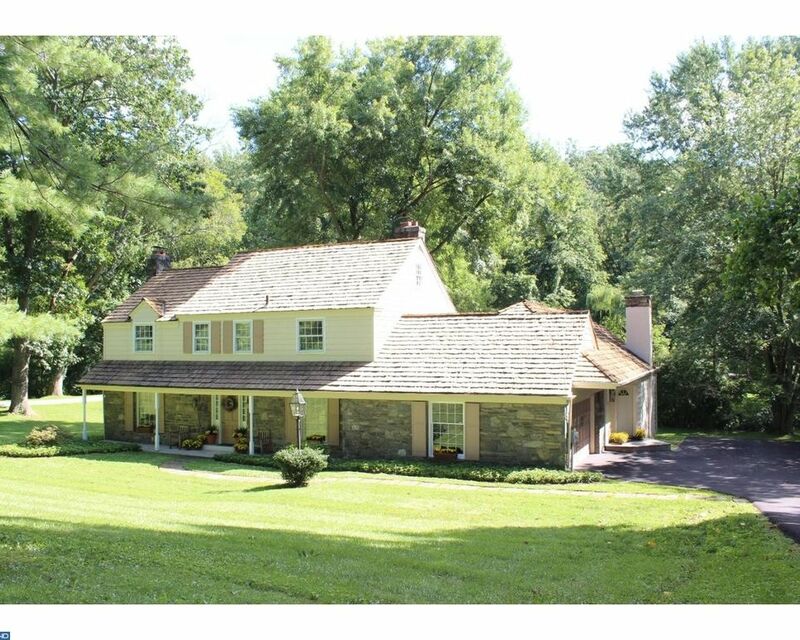 This charming 4 BD, 2.5 BA stone colonial sits on a scenic, private, nearly 1 acre property in highly-ranked Radnor School District. Gleaming cherry & oak floors in almost all rooms, freshly-painted neutral decor, and large windows abound. Gracious front Entrance Hall opens to the Living Rm with gas fireplace on one side and Den with a stone see-through gas fireplace on the other side. The Dining Rm has an oil-rubbed bronze chandelier and large glass sliders to the flagstone patio. The Kitchen shares a stone, see-through gas Fireplace with the Den, and has black appliances (incl. a new cooktop), granite countertops, a large pantry, and breakfast bar seating. It features views to the Family Room, Den, and the Breakfast Room, which is flooded with light from skylights, windows, and a glass door to the rear patio. The soaring, vaulted Family Room has wood beams with accent lighting, floor-to-ceiling wood-burning stone fireplace, a large closet, and a wall of windows overlooking the rear yard. The side entrance has a private staircase which leads to an upstairs office with built-in workspace, file drawers, and storage closets. A Powder Room and Mud Room/Laundry with access to 2-car garage complete the main floor. Upstairs is a spacious Master BD with two closets, an en suite Master BA with shower stall and built-in vanity area. This distinctive room also has a 4th fireplace and French doors which open to a private balcony with incredible views of the creek and rear yard. 3 Hall BD share a Hall BA, which also has a linen closet and pull-down stairs for attic access. The unfinished basement provides ample storage. You'll love relaxing on the rear flagstone patio, with a vintage lamp post (imported from England), listening to sounds of the babbling creek and watching sunlight dance across the water and historic arched stone bridge. Located in the Newtown Square area of sought-after Radnor Township, this home is close to parks, schools, train, shopping, & restaurants in the charming villages of Wayne and Bryn Mawr. Easy access to the Blue Route, Center City, Airport and corporate centers. Don't miss this well-maintained home with beautiful views!